June is Adopt-A-Shelter-Cat Month established by the ASPCA to encourage the adoption of homeless felines. It’s no coincidence that Adopt-A-Shelter-Cat Month takes place in June. It follows the onset of “kitten season” when un-spayed moms give birth to a monsoon of kittens. Without a surge in adoptions in June, affectionate, well-behaved adult cats have to be euthanized to make way for the flood of unwanted kittens. If you’re considering adding a feline family member, now is the time to do it because shelters nationwide offer Adopt-A-Shelter-Cat Month incentives. Inducements may include waived or reduced adoption fees, Seniors for Seniors programs, free vaccinations, spay/neuter surgery, viral testing, microchip or cat accessories. 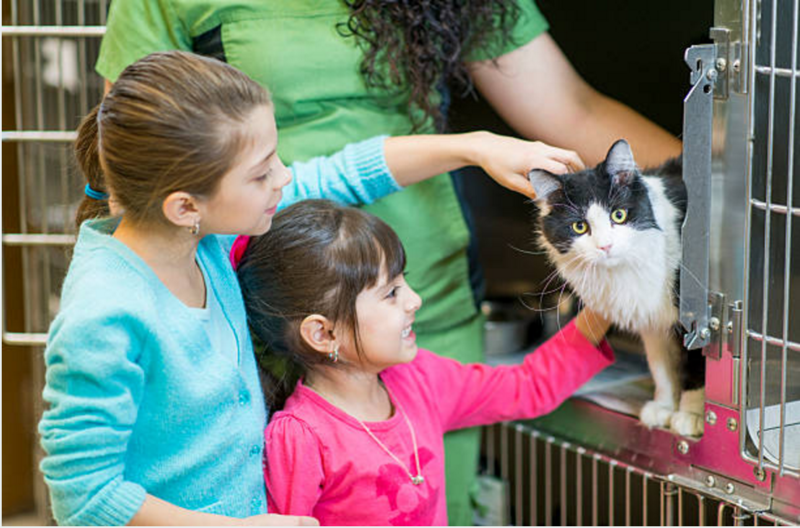 “Acquiring a new feline companion from a shelter is a wonderful venture,” commented Dr. Vicki L. Thayer, a board certified feline veterinarian and the executive director of the Winn Feline Foundation. Don’t hesitate to adopt a shelter kitty for fear of past traumas or behavior problems. Most kitties land in shelters through no fault of their own. Contrary to common misconceptions, shelter cats are often victims of circumstance, such as a death, divorce, illness, loss of income, landlord issues, a move, pregnancy, allergies or a significant other who doesn’t like cats. Why should you adopt a shelter cat? You’re a hero! When you adopt from a shelter, you’re saving a life. Even if you adopt from a no-kill shelter, you’re freeing cage space for another homeless cat. If you want to be a superhero, give a home to an at-risk kitty. Because of lack of resources, shelters often euthanize animals they consider unadoptable first. These unadoptables include older cats, especially seniors, black cats, and kitties with physical challenges. Potential adopters tend to overlook older kitties when they’re surrounded by playful kittens. The beauty of adopting an adult is “what you see is what you get.” Kittens, like human tweens, change as they mature. That cuddly kitten may grow up to be aloof. If a senior kitty jumps in your lap at the shelter, he’s going to be a lap cat tomorrow and next year. He likely comes with manners and he’s less likely to climb the curtains. Please don’t pass up a senior because you fear you won’t have much time with him. Inside kitties can live 14 to 18 years, so you could have a long future with your new friend. Black kitties also suffer from adoption discrimination. Prospective adopters don’t notice black cats because they’re harder to see inside a cage. Then, there’s that bad luck reputation. In truth, black cats are considered good luck in most parts of the world; in many countries, you need a lucky black cat to ensure health, happiness and prosperity. Special needs cats also get snubbed by families, but caring for a cat with physical issues is a sweet experience. Why not adopt a kitty who has a beautiful spirit, but a less than perfect body. Dr. Valarie V. Tynes says cats with only three legs get around just fine, but she cautioned about letting them outside. Dr. Tynes is a board certified veterinary behaviorist with Ceva Animal Health. She adds blind cats cope quite well, but don’t move the furniture once the cat has become used to the home. Special kitties teach kids compassion, and how to accept people with disabilities. Children with physical challenges often bond closely with a pet who has similar conditions. The old cliché warns, “Don’t judge a book by its cover.” It’s hard to judge a shelter cat when you see him cowering in the back of the cage. He’s stressed and scared spitless, so his real personality may not shine through. Take some time to check out the timid cats. You’re not seeing them at their best. Shelter staff may be able to help you discover these hidden gems. Animal shelters provide one-stop shopping. You don’t have to run all over looking for the kitty of your dreams. Shelter cats come in every color, age, coat length, gender, and activity level. Looking for a fancy cat? Pedigreed cats frequently show up. If you feel you must have a declawed cat, get one from a shelter and save yourself the expense of declaw surgery. Good economics. Adoption fees may include spay/neuter surgery, vaccinations, worming, microchipping and feline leukemia/FIV testing. During Adopt-A-Shelter-Cat Month the deals are even better. Cats provide health benefits. Owning and caring for a pet has positive benefits for the owner’s physical and mental health, Dr. Chiaramonte says. Having a cat lowers blood pressure, and decreases the risk of heart attack and stroke. The presence of a kitty diminishes loneliness and depression. When you get your new cat home, set up a comfy sanctuary in a bathroom or guest room. Provide all the necessities: litter box, food/water, toys, vertical scratcher and elevated resting places. For a few days, keep him in his sanctuary, especially when you aren’t around to supervise. This gives Kitty a better chance to become accustomed to his surrounding and learn the location of his litter box. 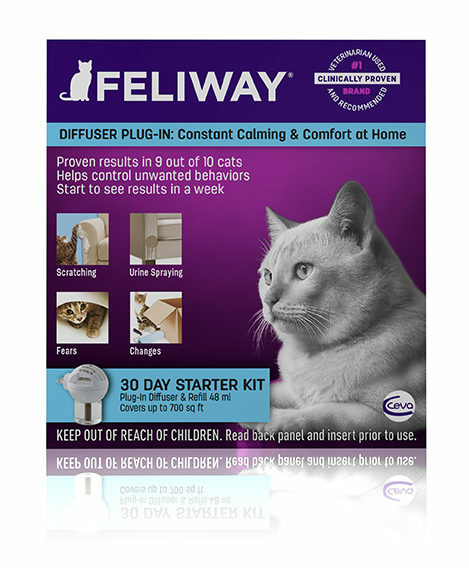 Dr. Tynes also recommends reducing Kitty’s stress by plugging in a Feliway Classic diffuser. Feliway Classic is a synthetic feline facial pheromone that gives a cat a sense of comfort about his new surroundings. If you want them to get along, increase the number of litter pans and spread out food, water, litter boxes and scratching posts throughout the house. That way no cat can prevent other kitties from eating or using the litter box. Place food/water bowls well away from litter pans. “Introductions to other animals should then be performed very slowly through a baby gate under controlled circumstances after a few days,” she says. It’s best to wait until the new cat appears relaxed, and your established kitties are no longer hissing at the door. To increase the chance that everyone will along, owners should consider using Feliway Multicat diffusers in the rooms where the cats spends the most time.